Organizers said that the conduct of the forum is in the context of the growing phenomenon of contractualization among both public and private workers, President Rodrigo Duterte’s periodic statement to stop contractualization, and the proposal for national industrialization as a key socio-economic agenda to resolve contractualization in the ongoing peace talks between the Government of the Philippines (GPh) and the National Democratic Front of the Philippines (NDFP). The speakers in the forum were Ferdinand Gaite, national president of the Confederation for Unity, Recognition and Advancement of Government Employees (Courage) who discussed the Contractualization in the Public Sector and Elmer “Bong” Labog, national chairperson of Kilusang Mayo Uno (KMU), who discussed Contractualization in the Private Sector, and National Industrialization. Gaite said that while the President is calling on the private sector to stop contractualization or close shop, government must set the example in its own backyard because 2010 Civil Service Commission figures on the number of casuals/contractuals with employer-employee relationship alone is 119,405 while the number of contract of service and job orders has reached 281,586. Both speakers pointed out that contractualization, a world phenomenon, is prevalent because of neoliberal policies that ensure superprofits to capitalists and big savings to governments at the expense of workers’ right to secure jobs. They also said that this flexible labor scheme, which is called various names: Memorandum of Agreement (MOA), Job Orders (JOs), Emergency Hire (EH), Project-Based, Seasonal workers, etc. to circumvent labor laws and evade protests, is an attack on the wages, jobs and rights of workers. However, Labog added that despite the legal prohibition for contractuals with no employer-employee relationship to unionize, contractual workers in some establishments and government agencies have started to organize to assert their rights and some have already gained regular status and are entitled to the corresponding benefits. This has challenged Councilor Alangsab to look into the plight of local contractual employees like the auxiliary police forces, some of who have already been working for more than 10 – 20 years now with no fixed time and with very meager salaries and benefits. 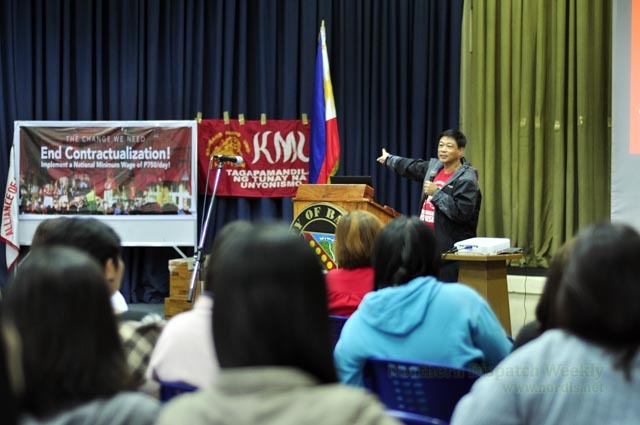 Labog’s presentation on National Industrialization cited government data that the Philippines has enough mineral reserves to be able to industrialize and create sustainable jobs for the millions of unemployed, underemployed and other Filipino workers who are leaving the country in thousands daily to seek employment abroad. He added that national industrialization however must come hand in hand with genuine agrarian reform that shall empower the 78% farmer population who must have the purchasing power to be able to buy the products of the industries. Further, he said that national industrialization must be able to build machines that will modernize the country’s backward agriculture, and genuine agrarian reform must be able to produce the materials needed for national industrialization. The forum ended with resolutions to conduct more discussions on these topics in the various agencies, institutions, companies and work places; deepening of research work on contractualization; support of unions for the issues of contractual workers; support for organizing of contractual workers and support for collective actions that shall assert the rights and welfare of contractual workers including their regularization. In other words, the workers’ greater push so that the President’s promise to end contractualization will be realized. The forum was attended by around 120 participants coming from the academe, the health sector, the government line agencies, the local government units, the health sector, the private sector, some people’s organizations, church organizations and some non-government organizations.